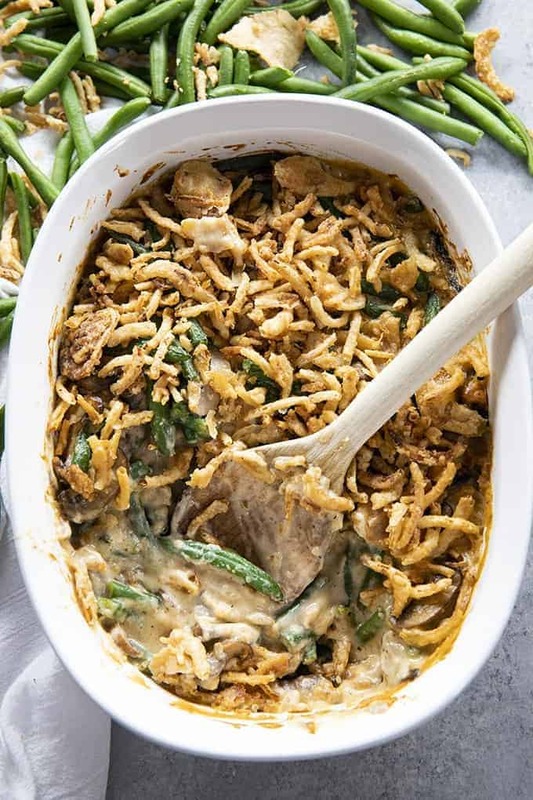 Green Bean Casserole – Learn how to make the best green bean casserole recipe at home from scratch! 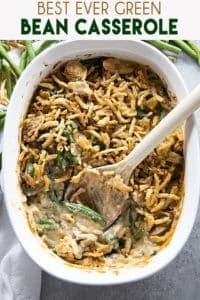 This easy casserole is full of fresh green beans, mushrooms, a creamy cheese sauce, and french fried onions! The original green bean casserole originated during the 50’s when the use of canned condensed soups became popular! It was a simple mixture of green beans, cream of mushroom soup, and French fried onions. 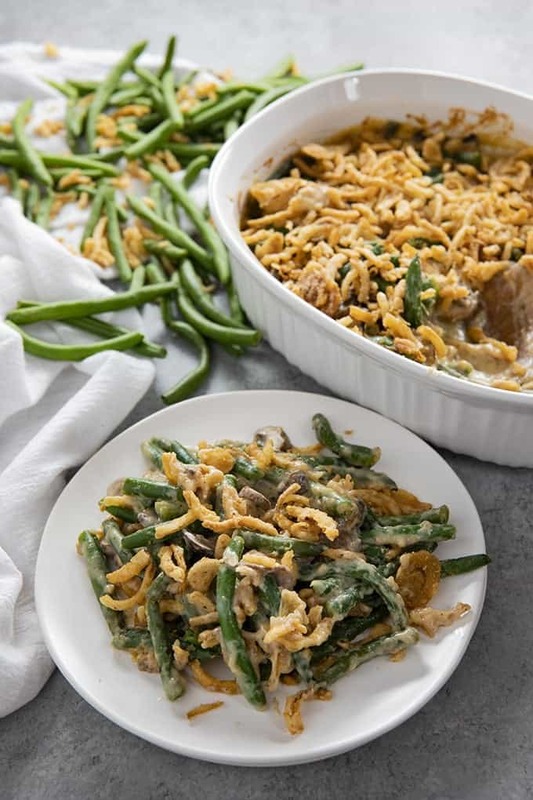 If you love that classic, no fuss version, then definitely try my Slow Cooker Green Bean Casserole! 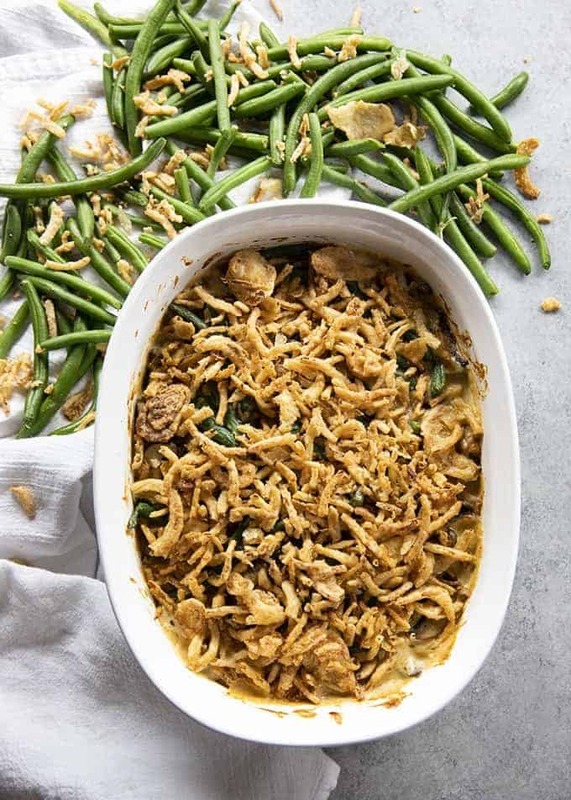 Over the years, people have adapted from the standard to really make green bean casserole their own. 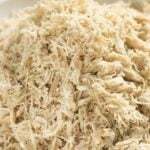 And while cream of mushroom has been a Midwestern staple for years, food from scratch just typically tastes best! 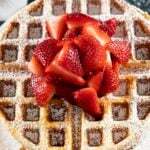 We happen to love the fresh and flavorful version that I’m sharing with you today. It is SO EASY to make, and really takes a classic holiday side dish to a whole new level! How Do You Make Green Bean Casserole with Fresh Green Beans? To make green bean casserole with fresh green beans you simply need to trim the very ends off of the beans first, and then cut them in half. You can also purchase pre-trimmed green beans at your grocery store. Then, you will place them into a large pot of salted, boiling water for about 5 minutes, just until tender. If you like very soft green beans, you can boil them for a couple of extra minutes. Can Green Bean Casserole be Made Ahead of Time? Yes! If you’d like to make this casserole in advance, just make as directed and then allow it to cool completely to room temperature. Then, cover the casserole tightly with a layer of plastic wrap, and a layer of foil. Then, you can refrigerate for up to 48 hours. Or, you can freeze for up to 2 weeks. How do you Make the Best Green Bean Casserole? First, cook the green beans in a large pot of boiling salted water just until tender. While the green beans are cooking, you can go ahead and make your creamy mushroom sauce! For this, you will melt butter in a large skillet and cook your garlic and mushrooms for just 2-3 minutes until mushrooms are tender. Next, you will sprinkle the flour over the mushroom mixture while cooking and stirring for one minute. Then season and gradually whisk in the milk and chicken broth. Once your sauce has come to a simmer you will remove the pan from the heat and pour the sauce over the green beans in your prepared dish, along with half of your french fried onions. Bake as directed in the printable recipe card below with full directions! 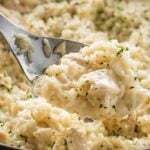 Be sure to serve these with other holiday favorites like these Cream Cheese Mashed Potatoes! 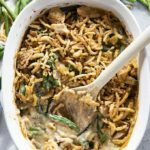 Green Bean Casserole - Learn how to make the best green bean casserole recipe at home from scratch! 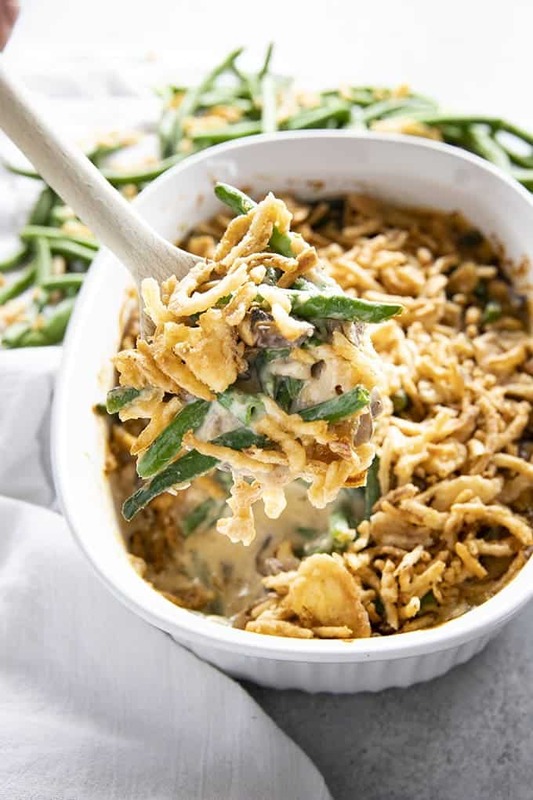 This easy casserole is full of fresh green beans, mushrooms, a creamy cheese sauce, and french fried onions! Preheat your oven to 350 degrees. Butter a 9x13 inch baking dish and set aside. Wash and dry the green beans. Place them on a large cutting board and trim off the ends, then cut the green beans in half. Add the beans to the water and boil for 6 minutes, drain and place into the prepared baking dish. Meanwhile, heat a large skillet over medium-high heat and add the butter. When the butter is melted add the mushrooms and garlic. 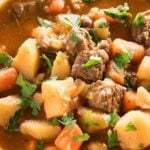 Stir and cook for 3-minutes until vegetables are tender. Sprinkle the flour over the vegetables and stir for one minute. Slowly stir in the chicken broth and milk until your sauce is smooth. 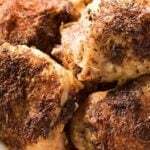 Season with salt, pepper, Italian seasoning, and Paprika then reduce heat to low and allow the sauce to come to a simmer. Remove the pan from the heat and stir in the cheese until melted. Pour the sauce over the green beans and stir in 1/2 cup of the french fried onions. Bake for 15 minutes, until bubbly. Remove the casserole from the oven and top with remaining onions, bake for 5 more minutes. NOTE: This recipe serves 8-10 people as a side dish. You can easily double the recipe and still use a 9x13 inch baking dish. If you are doing triple the recipe, you will need to use two pans. NOTE: To make this ahead of time, cook as directed then cool the casserole to room temp. Then you can cover tightly with plastic wrap and foil and chill in the refrigerator for up to 24 hours or freeze for up to 2 weeks. NOTE: You can use canned and drained, or frozen green beans for this recipe. This is a must-make! A great addition to our Thanksgiving table! 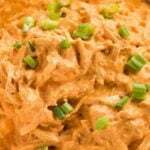 Such a classic side dish for Thanksgiving! Love that this is all made from scratch! 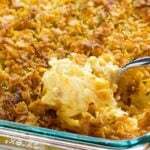 I’m crazy about this casserole! Your recipe really impresses me. You are a genius! I am sure that my family will be delighted with this, it looks very tasty. My family will absolutely love this on week nights ! I’m loving this homemade version! A tasty twist on a classic!